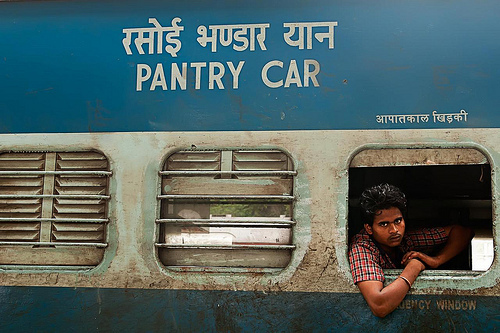 Indian Rail Pantry Catering – one of the biggest contract in Indian Railways is possibly turning out to be the biggest pain for passengers travelling on long distance journeys. 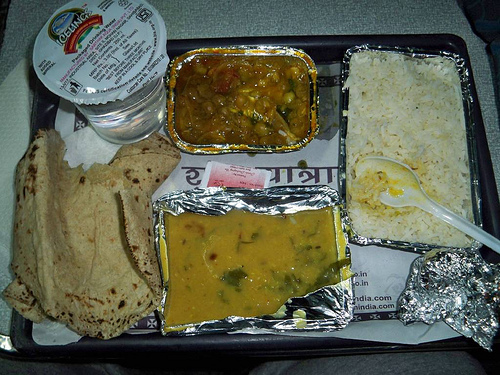 While the passenger has to trust (and in many cases has no other option) the pantry car for supplying hygienic food, the contractors are doing their best to squeeze out money and serve just bearable food. All this under the nose of the government which awards these contracts and is responsible for overlooking these contractors. How and Why does this happens ? I tried finding during my return journey from Bilaspur to Delhi. I was travelling in Sleeper coach as I could not get confirmed 3AC reservation. What this does is that I loose the preferential treatment from pantry guys in 3AC, I get dirty and crowded coach to sit it which is raided by vendors whenever they wish and I have to use a bathroom which I would never use under normal circumstances. Anyways, perils of travelling in sleeper coach later. I ordered food (dinner) to the pantry boy who was collecting orders. The irregularity that I noticed was that the pantry boy didn’t show/had any menu card nor did he disclosed the price of food. The price list is not displayed anywhere except possibly the pantry car coach where its produced on demand. My food came promptly with the following items 1) Dal 2) Aloo Sabzi 3) Rice 4) 2 Roti. Not tempting for sure but what to do when a man is hungry ! Now came the bomb surprise when I was asked for Rs. 82 for the plate of dinner I had. Not only me but other co-passengers who were having the same food were surprised. Sensing our surprise and anger, he did the best thing. He went and got the bill and sat down to talk – all this to prove his innocence in all this. So while there was no “Mix Veg” (it was plain aloo matar sabzi) and “Papad” in the food served, the same is shown in bill, still authenticating that Rs. 82 is the caterer decided price to be charged. 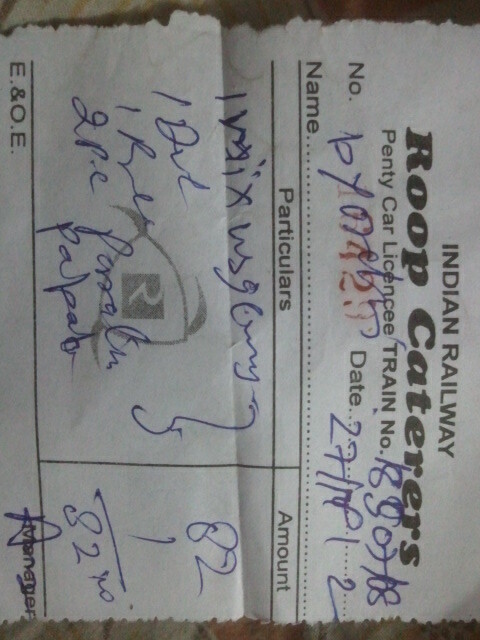 Ironically, Sleeper ticket costs Rs. 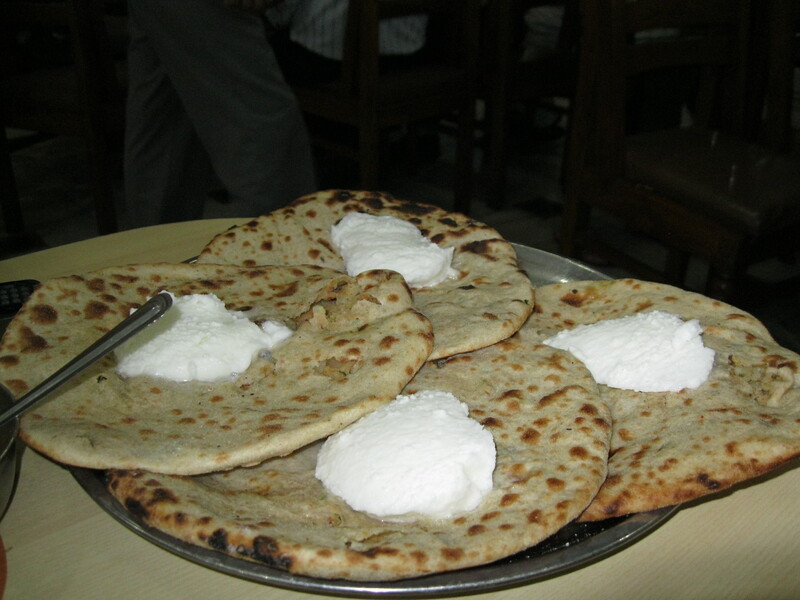 350 for a 1000 km odd journey where you will order day and night meals and if you add to that breakfast of Rs. 50 (Yes ! They charge Rs. 50 for breakfast of 2 cutlets + 2 breads or 2 breads + omlette) it works out to Rs. 214 which is 70% of the ticket cost itself. And all this with the approval of the government who approves these tenders and these prices/menus. Does the government really thinks Rs. 82 is the right price to be charged on train for such a measly meal, moreso when there are such class of people travelling who travel in Sleeper Class to save some money. The result of all this is that they end of eating unhygienic cheap food served at station stops or vendors. Our talk with the pantry boy revealed more interesting facts. Apart from the fact which he asserted that these are government approved rates, he acknowledged that the food quality is not good and the contractor is loosing out customers with high price low quality food. On an average per coach, the pantry car prepares 20 plates of food. For our particular train, 250 dinner plates had been prepared. Our discussion happened around 10 PM and he told us that only 100 plates were sold. What happens to the remaining 150 ? The excess food is thrown away !! Simply thrown away !! Wasted !!. Made me feel angry for such wastage of food to happen. Supposedly the contractor prefers throwing the food over selling it for lesser price. Is this really the policy under which contracts are given to contractors ? So how does the contractor make money if so much wastage and loss of food happens. The pantry boy revealed that the cost of this food wastage is inbuilt in the food served to us which is why its being served at high price of Rs. 82. So not only are we make to pay high price for barely eatable quality food, we also are made to pay for food wastage which the contractor does just to keep the prices jacked up. While we all ended up paying Rs. 82 for the meal, we felt cheated and more-so angry for never complaining about this to authorities. I for once decided to put out this blog-post as a complaint against this wastage of food and loot of money. I did search out on google other people who had complained on public forums. If only the government can look into it and take some action to bring such scrupulous practices to an end so that the journey on Indian Railways can become pleasurable, safe and healthy.